Planning the interior design of your bedroom can be quite difficult, especially if you're working with limited floor space. You absolutely need the essentials – a nightstand, a chair or two, a dresser and bedroom storage units. But do you need a television, desk or a trunk at the end of your bed? Take some time to figure out what can enhance and what can clutter your bedroom given its layout and square footage. As you start striking off bedroom ideas and/or adding new ones, browse our collection of bedroom furniture, wardrobe doors and storage units to create a visually-pleasing and functional retreat. 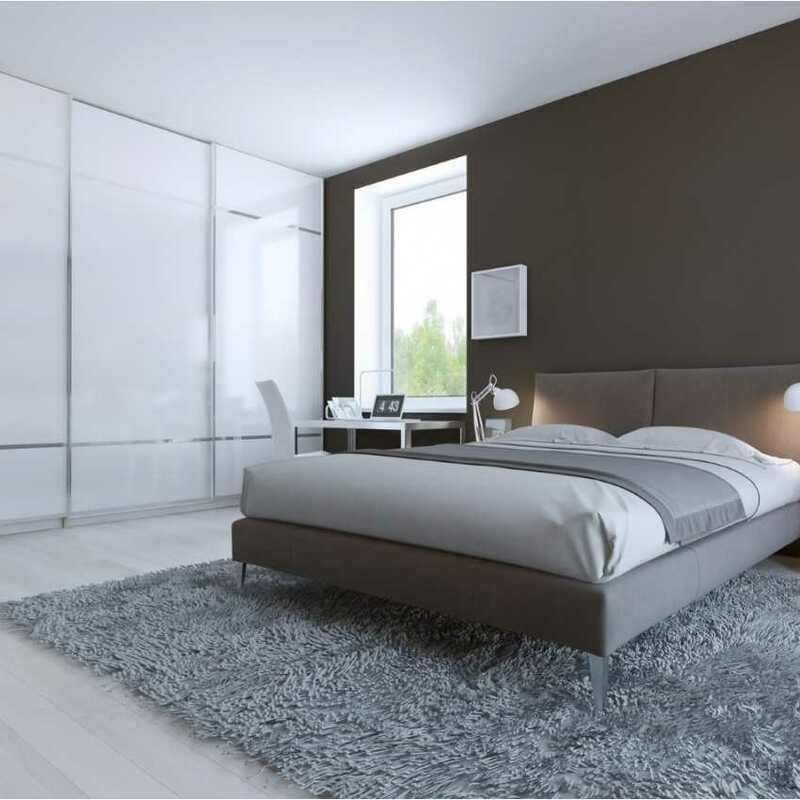 Your bed is the focal point of your bedroom and the starting point to arrange the furniture you intend to add. In fact, the bed itself is a category of furniture, so your very first decision may be to decide the size and design of your bed. Modern beds are available in a range of lengths (measured by the length of the side rails) and can be either minimalist or elaborate. There is also an array of free-standing bedroom furniture, from desks to night-stands. You'll need to decide whether you need a small corner desk to fill a dead space in a part of your bedroom or a proper work desk which you will be using very often. In selecting a night-stand, you must determine if a modern glass nightstand suits your contemporary bedroom or a wood finish is a better option. Then there is the price factor: are you willing to pay a big price for fabulous furniture pieces or are you fine buying cheap bedroom furniture for the time being? Regardless of the bedroom ideas you have in mind, browse our collection and you're sure to find something you like and must absolutely have! Your choice of bedroom storage units will depend on what all you expect to stow away in the room. This will help you assess the drawer and hanging space required to securely and comfortably store those items. When it comes to storage units, what is on the inside is more important than what lies outside! Smart internal storage is just what you need to maintain all your 'stuff' in a clutter-free manner. Thoughtfully-designed bedroom storage units typically allow you to compartmentalize different things – whether its clothes and towels, just shoes, or clothes, shoes and accessories....through drawers, hangers, cabinets and other nifty organizers. Check out the catalog of bedroom internal storage units from different manufacturers on our site. You'll be surprised at some of the innovative and creative solutions that clear the mess and suit the needs of the hoarders and compulsive buyers amongst us! Sliding wardrobe doors are an excellent option when you have limited space. They help you save space by doing away with the hinged doors in regular wardrobes and integrating into your wall with side panels. They are available in a range of styles and finishes, which means you don't have to tear your hair out trying to find one that complements the rest of your interior décor perfectly! Peruse the sleek and high-quality sliding wardrobe doors from reputed manufacturers on our site and don't hesitate to contact us for more information. Bedrooms There are no products in this category. When looking to furnish or upgrade your bedroom furniture there are two main factors to consider, one being storage and organizational capabilities of the furniture which leads to a clutter free area and the other is its styling and relaxation properties which not only provide a good start to the day but also insures a peaceful end to one. Please view any of our bedroom furniture improvement categories below to see what products are available that will make these considerations easier to achieve. Having bedroom cupboards are great but it sometimes can be disorderly and cluttered this can all be fixed by using internal storage solutions that will make your bedroom cupboards allot more organized and user friendly. View below our full range of internal bedroom storage units that can help make everyday tasks less time consuming. The benefits of sliding bedroom doors are well known and have led it to become the favourite alternative to its hinged counterpart, Our sliding door collection will not only give you a renewed design inspiration but will also help you get allot more out of your budget in terms of styling and functionality. • Choose from 7 standard panel conﬁgurations, over 40 stunning panel colour and finish options, and a choice of matt aluminium or lacquered bronze frame ﬁnishes. • Incorporating technology from Astin, one of the leading companies in the ﬁeld of sliding doors, the Bretton Park system offers a smooth opening and closing action and comes with the added option of built-in soft closing for that extra touch of sophistication. • It does not matter how high your chosen door is. The price is determined by the width of the door and the number of panels in the conﬁguration. STEP 2: Select the door height; width and panel colours. STEP 3: Select the available internal storage accessories available (Optional). ** Remember to supply dimensions for internal height, internal width and the width for either double or single track (this will usually be the same as the internal width measurement). - If you are using up to 4 doors then a double track should be enough. - if you are using up to 5 doors and above then a single track will also be required. • This is a special order product that can’t be cancelled/amended after ordering. Each item is bespoke to your order and a non return policy applies. Click on any category below to view door options, colours or accessories available.